The temperature is dropping colder at night. The chill can be felt through your coat as you wrap your arms around yourself to keep warm. You bundle up just to run out to the mailbox. Winter can be an inconvenience or a nuisance for those who dislike cold weather. But for the elderly, cold weather can be a serious health hazard. As we get older, our bodies become less efficient at regulating our body temperature. This puts many seniors, especially those over the age of 75, at risk of hypothermia. And getting hypothermia doesn’t necessarily mean they are outside for long periods of time, but it can happen within their own homes. Hypothermia is a dramatic drop in body temperature. Normal body temperature averages 98.6 degrees, while hypothermia is when the core body temperature drops below 95 degrees. If you suspect your loved one has hypothermia, they must get immediate care. 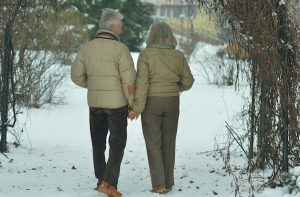 The risks of hypothermia in the elderly from Aegis Living’s Chief Medical Officer, Dr. Shirley Newell. Slower metabolism. Seniors have a more difficult time maintaining a normal body temperature. Even in their home, the risk for hypothermia increases if the room temperature dips below 65 degrees. Chronic medical conditions. Many common diseases among the elderly can make it more difficult for seniors to stay warm. Conditions such as diabetes, heart disease, arthritis, stroke, Parkinson’s disease, or an underactive thyroid can increase the risk factor. Medications can affect body temperature. Some medications may change how the body regulates temperature. Seniors on antidepressants, nausea medications and some over-the-counter cold medications can make seniors more vulnerable to cooler temperatures. Fixed income. Senior on a tight budget or in an effort to save money or be frugal may not use the heat or may not keep their home warm enough. How can hypothermia be prevented inside the home? Of course, the obvious answer is to keep their home warm. Check that their house is well-insulated and never let the thermostat dip below 65 degrees. Talk to their physician to see if their health, medical conditions, or medications are putting them at greater risk of hypothermia. Keep plenty of warm blankets handy and sweaters within an arm’s reach. If they have a fireplace or wood-burning stove, double-check their wood supply. How can hypothermia be prevented when outdoors? When outdoors, encourage your loved one to bundle up in proper attire to protect them from the cold, moisture, and wind using multiple layers of clothing. We suggest they wear a warm hat since large amounts of body heat can escape through your head. Maybe consider getting them a holiday gift of wool socks, hats, gloves, scarf, and thermal base layers for under their clothing to keep them extra warm and comfortable. During these cold months, it’s not advised for the elderly to work outside for long periods of time. Offer to help with yard work or hire help during the winter to assist them. Many of us would not think twice about getting hypothermia on a 60-degree day. But for our aged loved ones, they are at risk of hypothermia. On a day that you might not even wear a coat, they could be in danger.